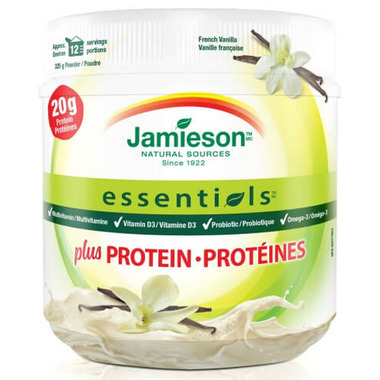 Jamieson Essentials plus Protein supplements provides you with the nutrition and energy you need to get you through your day – all in a convenient and tasty format! This unique formula features all four recommended Jamieson Essentials: 100% Multivitamin, 600IU Vitamin D3, 1 Billion CFUs Probiotic and 350mg Omega-3 from Flax plus 20g of Protein per serving. Suggested Use: Take 1 scoop (see below (g)) daily. Mix with 1 cup (250 mL) of water/milk/milk alternative/juice or to a smoothie. Drink plenty of fluids before, during and after exercise. Take at least 2-3 hours before or after taking antibiotics or antifungals. Each scoop = (27.5 g). Providing 4.92g of protein, Flaxseed (Linum usitatissimum, seed) 1.522 g, Providing 350 mg alpha-linolenic acid (ALA) (Omega-3 fatty acid) & 0.32 g of protein, Ganeden BC30™ Bacillus coagulans (GBI-30, 6086) 1x109 CFU, Vitamin A (Acetate) 900 mcg RAE 100%, Vitamin B1 (Thiamine mononitrate) 2.25 mg 187%, Vitamin B2 (Riboflavin) 3.2 mg 246%, Vitamin B3 (Niacinamide) 16 mg 100%, Vitamin B5 (Calcium d-pantothenate) 10 mg 200%, Vitamin B6 (Pyridoxine HCl) 3 mg 176%, Vitamin B12 (Cyanocobalamin) 12 mcg 500%, Vitamin C (Ascorbic acid) 90 mg 100%, Vitamin D3 (Cholecalciferol) 15 mcg/600 IU 100%, Vitamin E (dl-alpha tocopheryl acetate) 15 mg AT/ 22 IU 100%, Vitamin K1 120 mcg 100%, Biotin 45 mcg 150%, Folate (Folic acid) 400 mcg 100%. Nutritional Facts: Vanilla (27.5g), Calories 120, Protein 20 g, Carbohydrates 2.5 g, Sugar 1.5g, Fibre 0.5g, Fats 2.0g, Saturated 0.1g, Trans 0, Cholesterol 45mg. Vanilla Sucralose, xanthan gum, lecithin (soy), stevia, dicalcium phosphate, inulin, natural flavour. Caution: Consult a health care practitioner prior to use if: you are pregnant or breastfeeding or are taking blood thinners; you have fever, vomiting, bloody diarrhea or several abdominal pain. If symptoms of digestive upset (e.g. diarrhea) occur, worsen, or persist beyond 3 days, discontinue use and consult a health care practitioner. Do not use this product if you have a milk allergy or an immune-compromised condition (e.g. AIDS, lymphoma, patients undergoing long-term corticosteroid treatment). Contains milk and soy ingredients. Love this product! I use it in a smoothie every morning. Love that it replaces my daily vitamins and has probiotics. I can't comment on how it tastes mixed with just milk/water, but in my smoothies it is perfect. This is great, not sweet at all and no aftertaste or grainy texture. :) definitely my new protein powder!